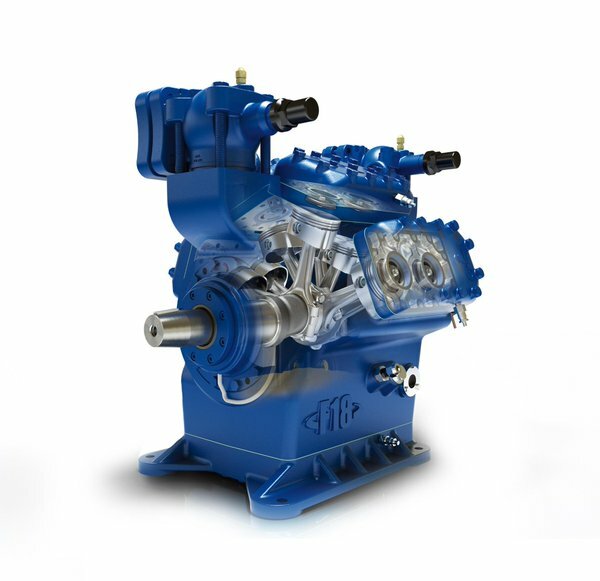 Southern Sales & Services supply compact piston F Compressors for drive with standard motors via V-belt or direct clutch. 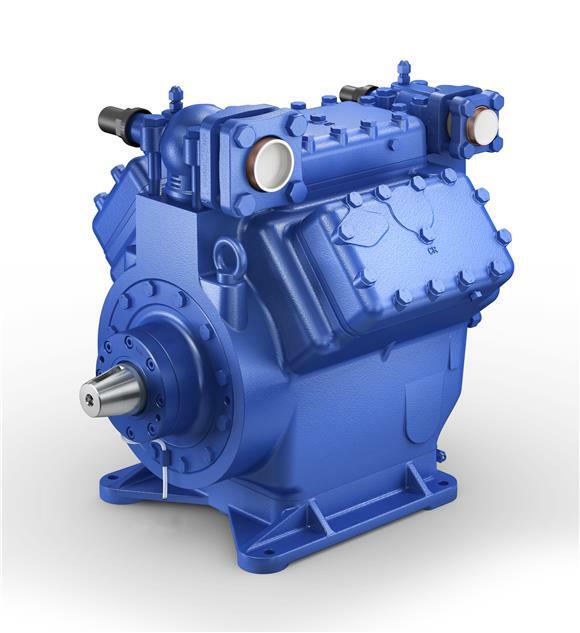 Flexible motor arrangement allows for practically all drive-related requirements. Suitable for all current refrigerants, also NH3. The F model series provides modern open type compressors for separate drive systems (using V belts or direct couplings). Load transfer through a V pair. Virtually all drive capacity requirements can be met. Very compact compressor design, robust and easy to handle. Oil pump lubrication as standard. In industrial as well as maritime applications, system operators often use open type piston compressors with an external drive when a high degree of reliability, flexibility and operational safety is required. Especially for these application fields, GEA Technologies now presents the new GEA Bock compressor models F18 of the established GEA Bock F-series.With F18 compressor GEA now closes the gap between the GEA product lines GEA Bock and GEA Grasso. The construction of the new 8-cylinder compressor models GEA combines the know-how in the small and medium output range with know-how in the higher output range. To meet the high quality demands of open-type compressors in this capacity range, GEA focuses on uncompromising quality. A plasma-nitrocarburized crankshaft for example drives the eight pistons of the compressor. At the same time, the F18 compressor sets new benchmark standards for open-type piston compressors.For the first time, the GEA Bock mexxFlow valve system is used in this compressor. The mexxFlow system is a flow-optimized double-ring design of the valve plate in combination with a cylinder head especially designed for the valve plate. Due to the use of this valve system, GEA is able to increase the efficiency of the compressor by 15%, compared to the use of standard valve plate technology. 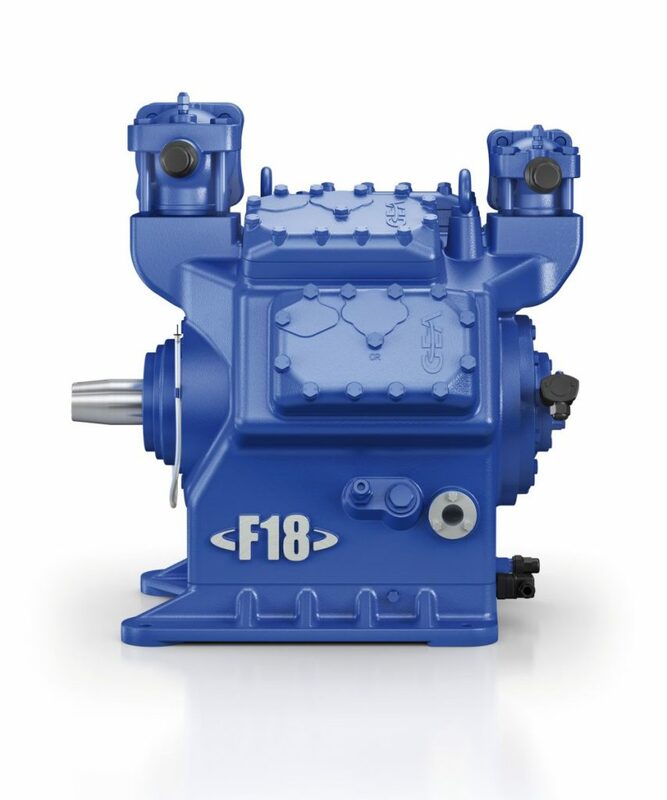 With these results, the F18 reaches a new level of efficiency for compressors of this type.When it comes to size and weight of the compressor, the F18 is also significantly smaller than competitors in this capacity range. A fact that makes the compressor much easier to handle, for instance for transportation or when taking it into a machine room. The F18 compressor is available for standard refrigerants with the start of the Chillventa. A special version for the established refrigerant for industrial systems NH3 (Ammonia) will follow. The F model series offers modern open compressors for external drive (via V-belt or clutch). Force transmission is by a form-fitting shaft connection. Nearly all drive-related requirements are possible. The compressor design is very compact, robust and easy to handle, naturally with oil pump lubrication. At the beginning of the year due to several insolvencies of our factory suppliers we were forced to stop the production of the open type compressors F2 – F14 which we informed you of this as per the the previous Production update in 2017. Due to continuous customer demand every effort has been made by the factory to return the affected compressors back to our portfolio therefore we are very pleased to inform you that compressors F2 to F14 including all known accessories will be available again from week 38, this includes the availability of spare parts. We would like to thank you for your continued business and support during this very difficult period. Since July 2017 due to insolvencies at several of our suppliers we have experienced substantial delivery restrictions that has had a detrimental effect on the open type compressors F2 to F5 and F14. We have tried to relocate the affected parts to other suppliers but unfortunately this has failed due to both capacity issues and the unacceptable high costs of new equipment, tools and qualification. Therefore, unfortunately we have to inform you that the compressor range F2 to F5 and F14 are no longer available from today. We cannot confirm any new orders, all orders that have already been confirmed will be fulfilled. We endeavour to maintain the supply of the spare parts but at present this is not fully manageable. Due to dimensions, mounting and connection sizes as well as the different housing materials (FK20 to FK50 is aluminium) these replacement options must be checked and approved by you the customer, of course you can contact our sales team and they will assist you with any questions you may have. We would like to mention that the larger compressors F16 and F88 are not affected. More refrigerating capacity and lower power consumption – this is the motto of the mexxFlow® valve plate system, which will form the heart of several new GEA compressor generations in future. Concerning the increase in energy efficiency of semi-hermetic compressors, one focus of compressor manufacturers has always been on the valve plate system. It is necessary to release the energy, which is applied by an electric motor, efficiently to the refrigerating circuit while realizing minimal energy losses. GEA has also put its focus of continuous development of reciprocating compressors on the valve plate system – the mexxFlow® system now reflects the result of this development work. GEA was successful in increasing the efficiency of its compressors by around 15 % thanks to a flow-optimized double ring fin construction of the valve plate in combination with a cylinder head, which is specially adapted to the valve plate. Thus, open type as well as semi-hermetic commercial GEA compressors achieve new records in terms of efficiency.